Originally from Berkeley, California, Katie is happily celebrating her 10th year of living in New York. She received her B.F.A in Dramatic Writing from NYU’s Tisch School of the Arts, where she was a recipient of the Charles Purpura Special Recognition Award. She is a nationally-produced playwright whose dramatic works include Re-Drowning Ophelia, winner of the California Young Playwrights award, and The Gospel According to Jeremy, which was selected for NYU’s Festival of New Works. 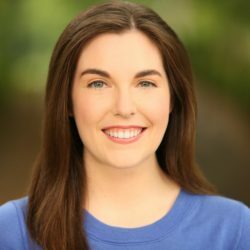 Her play Perfect Score, a winner of Stephen Sondheim’s national Young Playwrights Inc. competition, was published by Playscripts Inc. and has been produced by high schools and community theaters in over 30 states and several countries. Currently, Katie lives in Harlem and works as a young adult author. Her debut YA novel, Heretics Anonymous, released in 2018 from Katherine Tegen Books/HarperCollins. It received starred reviews from Kirkus and Booklist, was an Amazon Best Book of the Month, and was a top 10 selection for the New York Public Library’s Best Teen Books of 2018. Her sophomore novel, Let’s Call it a Doomsday, will be released in August 2019.